Everybody must come to know that why no company has ever made any domain universally useful although any successful domain acquires a caliber of making many corporations. To get a painting made, no civilized person would ever hire a company because any artist independently does that kind of a work most wonderfully. Writing code for your web or app is also such a thing even more than that. Still fools think that a company does any better in this regard. Corporations cannot ever acquire a caliber of writing poetry and that is the case for code as well. Only the hackers have that kind of caliber. Consistently practicing a programming language is the core education of Sangkrit, developing the ablest kind of coders in abundance. Changing many complicated ways of doing things by innovating any way easier is their religion. Doing independent jobs like coding webs and apps to get paid on hourly per terminal basis, they become professionals. This is going to disrupt the business of software companies in the long run as the Core Programmer at SANGKRIT.net leads such a patronage network of professional programmers via system at SANGKRIT.net that is the truly sustainable hacktivist movement in making. The hacktivist movement has to make people aware of everything. Everybody must come to know that why no company has ever made any domain universally useful although any successful domain acquires a caliber of making many corporations. 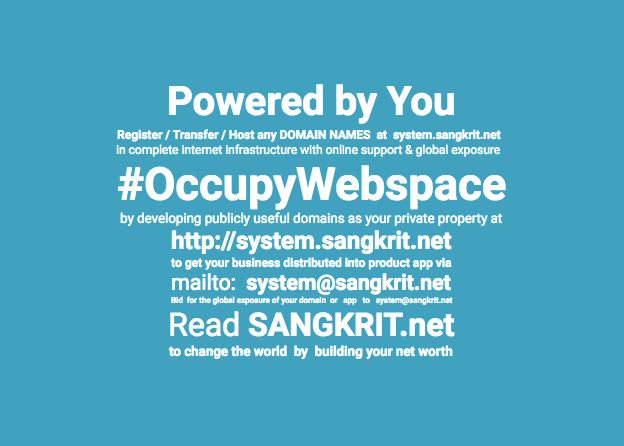 You should simply email to system@sangkrit.net to make your domain commercially useful.